If your aging parent has recently suffered an illness or injury that prevents them from getting out of bed, they need additional care to make sure their needs are met and they can stay healthy and comfortable during their recovery. It is important for you as a family caregiver to recognize the additional care challenges of a senior who is bedridden so you can help to prevent potentially serious issues such as skin damage and loss of mobility for when they are able to get up. 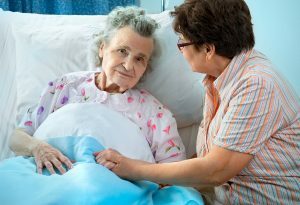 Proper care for your parent as they are going though this time can make a tremendous difference in their health, safety, and well-being later, even if they are permanently confined to their bed. If your aging loved one cannot get out of bed, consistent, dedicated care is essential to making sure they stay healthy physically and emotionally. Especially if you are a family caregiver in the sandwich generation, caring for your children as well as your senior, you cannot be with your parent all day, every day to make sure their needs are met effectively. This is where home care can come in. An in-home senior care services provider can step in to care for your parent on a customized schedule. This means they will have access to support and care when it is right for them to protect their physical health and boost their mental and emotional well-being as they age in place. IF YOU OR AN AGING LOVED-ONE ARE CONSIDERING HOME CARE SERVICES IN WAKE FOREST, NC, PLEASE CONTACT THE CARING STAFF AT SENIORS HELPING SENIORS TODAY. CALL (919) 761-5346. Should You Feel Guilty About Negative Emotions When Caring for a Senior with Cancer? What Are the Warning Signs of a Stroke?